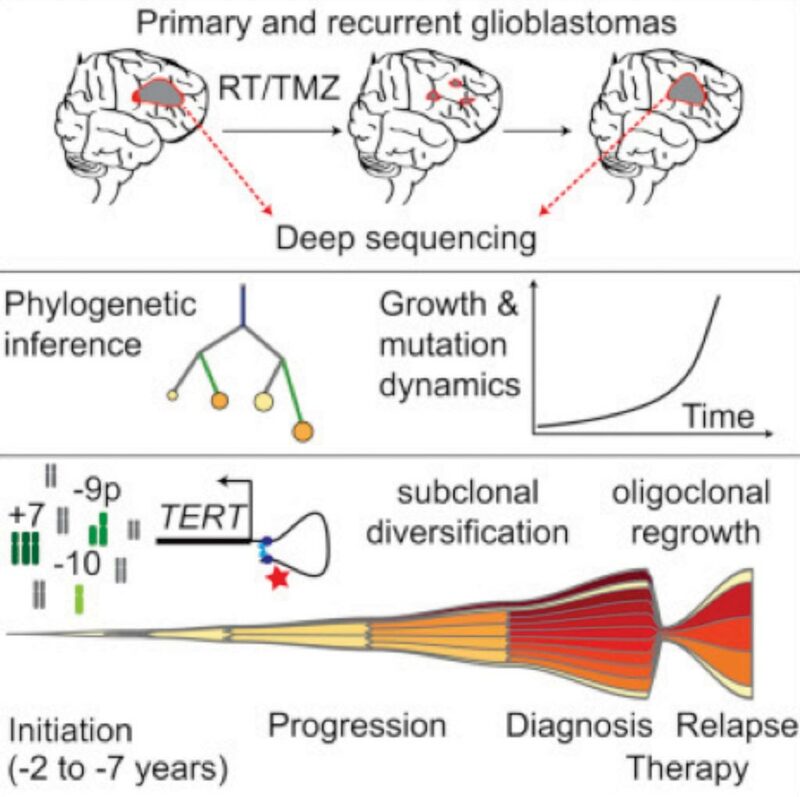 Genetic tumor profiling of gliomas is used to classify disease and guide therapy, but involves brain surgery for tissue collection; repeated tumor biopsies may be necessary for accurate genotyping over the course of the disease. While the detection of circulating tumor DNA (ctDNA) in the blood of patients with primary brain tumors remains challenging, sequencing of ctDNA from the cerebrospinal fluid (CSF) may provide an alternative way to genotype gliomas with lower morbidity and cost. 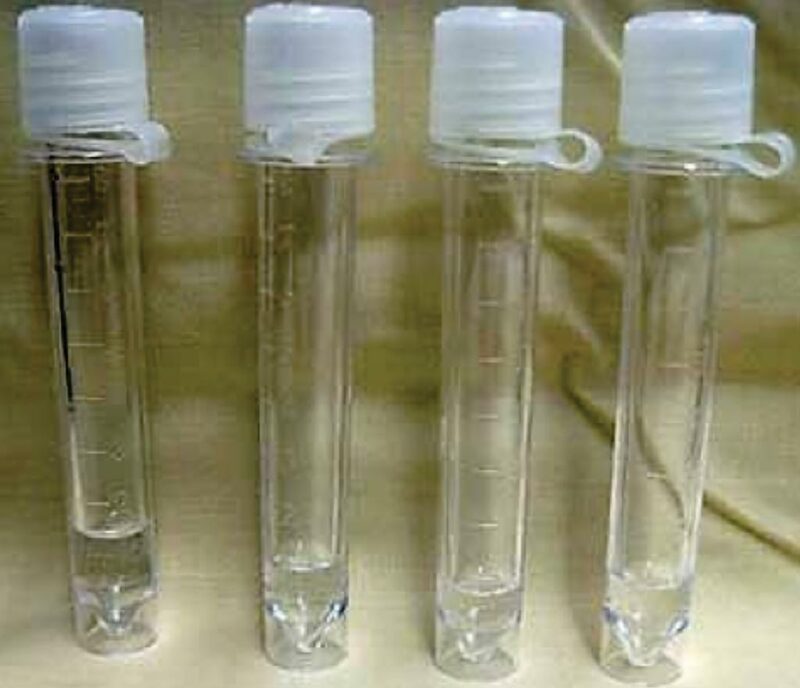 Image: Vials of cerebrospinal fluid that can be sequenced for cell-free DNA in glioma patients (Photo courtesy of James Heilman, MD). A large team of scientists led by the Memorial Sloan Kettering Cancer Center (New York, NY, USA) tracked traces of gliomas in CSF by collecting samples from 85 glioma patients who previously received a lumbar puncture because they showed neurological signs or symptoms of brain tumors. Patient diagnoses included 13 grade II gliomas, 26 grade II gliomas, and 54 grade IV gliomas. All patients had received treatment for glioma before CSF collection, including surgery, radiation, and at least one systemic tumor-directed chemotherapy. After extracting 3 mL of CSF from each patient through a spinal tap, the team ran the sample on a centrifuge to separate the pellets from supernatant, which contained ctDNA. While normal CSF typically contains a low white blood cell count, the team noted that including pellets dilutes the tumor signature in a sample. The investigators used MSKCC's MSK-IMPACT next-generation sequencing assay to analyze samples for genes relevant to glioma. Afterward, the team ran the results through a bioinformatics analysis pipeline, which included a mutation-calling element that MSKCC developed with the MSK-IMPACT. The scientists detected tumor-derived DNA in CSF from 42 out of 85 patients and found that the genetic material was linked to disease burden and adverse outcome. They also examined whether combinations of genetic alterations, lower-grade glioma signatures, that they detected in the CSF could be matched to the signature of the original tumor. Sequencing all available tumor biopsies from 36 patients who had positive CSF ctDNA, they found that CSF and tumor samples shared mutations in all 20 patients with wild type glioblastomas (GBMs) that were not hypermutated. The most common alterations in the samples included mutations in the TERT promoter, the protein coding regions of TP53, IDH1, deletions of CDKn2A and CDKN2B, amplifications of EGFR, and EGFR-variant III deletion. Alterations that occur early during tumorigenesis, such as co-deletion of chromosome arms 1p and 19q (1p/19q codeletion) and mutations in the metabolic genes isocitrate dehydrogenase 1 (IDH1) or IDH2, were shared in all matched ctDNA-positive CSF–tumor pairs, whereas growth factor receptor signaling pathways showed considerable evolution. Michael Berger, PhD, a co-author of the study, said, “Compared to other liquid biopsy applications, cerebrospinal fluid has the potential to enable more sensitive detection of ctDNA because most of the cell-free DNA in CSF is shed from tumor cells. There is very little background DNA from non-cancerous cells, in contrast to plasma where often only a tiny fraction of the cell-free DNA is actually derived from tumor cells.” The study was published on January 23, 2019, in the journal Nature Research.